Yellowjackets are house fly-sized wasps with distinct yellow and black markings and a few hairs (Figure 1). They construct a similar type of paper nest; however, it will be tan in color, much smaller in size compared to the hornet nest, and is usually found in an underground cavity. Common locations for nests are in lawns, particularly in sandy exposed areas, as well as at the base of trees or shrubs. Occasionally, yellow jackets nest in attics or walls voids of houses or storage buildings. In spite of their reputations, hornets and yellowjackets are actually beneficial because they prey on many insects that we consider to be pests. They also serve as food for bears, skunks, birds, and other insects. Unlike honey bees, hornet and yellowjacket colonies die out each year. If a hornet nest is built high in a tree, you may choose to simply wait until the colony dies out in late fall or early winter. The nest will slowly deteriorate from weather or from attack by hungry birds. Control is best achieved by applying a pesticide directly into the nest opening. This can be done at anytime of the day, but near dusk, most of the wasps are more likely to be inside the nest. You can use any of the aerosol "Wasp & Hornet" sprays that propel insecticide in a stream about 10-12 feet. Direct the spray into the nest opening and then move away from the area in case any of the wasps emerge from the nest. You may need to be repeat the treatment on the following evening. Long sleeved shirt and long pants may be worn when spraying to make the applicator feel more at ease. Do not hold a lit flashlight or stand near car headlights or other lights. Emerging wasps may be attracted in that direction and sting anyone nearby. Controlling Bald-Faced Hornets and Yellowjackets in and Around Structures, Biting and Stinging Pests. Waldvogel, M., P. Alder, and S. B. Bambara. 2018. 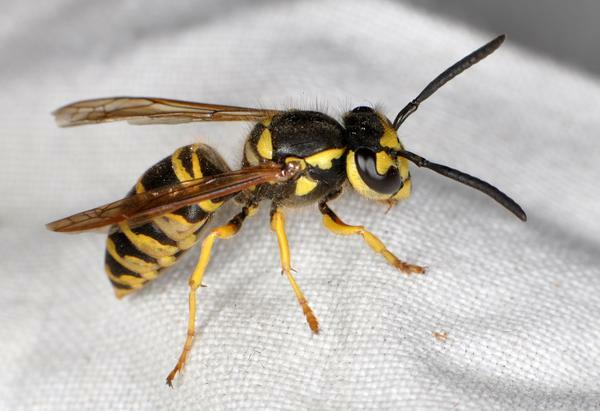 Common name: yellowjackets and hornets, scientific name: Vespula and Dolichovespula spp. (Insecta: Hymenoptera: Vespidae). Grissell , E. E. and T. R. Fasulo. 2013 (revised). Featured Creatures, Entomology & Nematology. FDACS/DPI, EDIS, UF|IFAS. Publication Number: EENY-81. Yellowjackets of America North of Mexico. Akre, R. D., et al. 1980. U.S. Department of Agriculture, Agriculture Handbook No. 552, 102 pp. Pest Control for Professional Turfgrass Managers. Bowman, D. et al. 2017. NC State Extension Publication AG-408. 81 pp.